president, (l-r) receive an award for supporting active military employees. 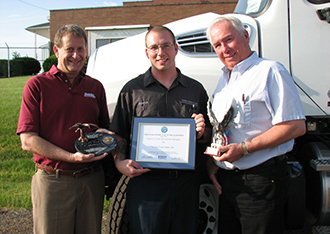 Young Truck Sales, Inc., a commercial truck dealership in Canton, Ohio, was recently awarded the Pro Patria Award in the small business category. The annual award, presented by the Employer Support of the Guard and Reserve, is given to three businesses in the state -- one small business, one large business and one public sector organization -- that are scored on how well they support their active military employees. “The Pro Patria award is a very special and humbling honor for Young Truck Sales,” said Craig Young, president and CEO of the dealership and an ATD/Heavy Duty Trucking Truck Dealer of the Year nominee in 2011. Shaun Mosiychuck, an employee in the parts department, nominated the dealership for the award after serving at Shindad Air Base in Afghanistan in 2011 and 2012. While deployed, the dealership continued some of his benefits and encouraged employees to keep in touch with him while he was overseas. The dealership, which sells Freightliner, Volvo and Isuzu new and used trucks, was also given the Above and Beyond Award that recognizes 30 employers statewide for exceeding the legal requirements of maintaining employment for mobilized service members.